Just last week at Friday Mass, we read all about friends from the Book of Sirach [6:5 – 18]. I have been blessed with many people I call ‘friend.’ The two funniest men I know are my friends: Jim Tothacer from Tennessee, and Dave McGrath, the Irish Wise One who mentored me in journalism more than 30 years ago in Boonville, NY. Dave and I exchanged emails since it became fashionable in the 00’s, and he never failed to call me at least once a year to share a good joke and a laugh. He called in late March 2013 yanking my chain about something. He was the same old Dave. An hour ago, Dave’s best friend informed me that Dave died on April 6, 2013. That was probably within a week or two when he last called me. Typical Dave… he could be having the worst day in his life and no one would ever know it because he refused to let his wonderful, leprechaunish smile leave his strong Irish face. That was Dave, always smiling. Dave was diagnosed with lymphoma in 2000. He was 66-years old when he moved on last month. That was Dave, forever grateful for whatever God gave him every day. 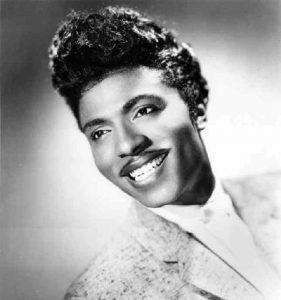 He sent me this fine picture of Little Richard and claimed it was him. I will miss those annual phone calls from my friend Dave, but I am certain the aura of his smile still surrounds his spirit. I have one regret. For years, Dave urged me to head east for a visit. I didn’t. My loss. Jim Tothacer, Danny Ulmer, Bozini, Honi “no-baloney” Garvin, Mert, David Hamilton, Jim Spinale… keep the light on. I’ll be headed in your direction when you least expect it. Life has no guarantees, especially in terms of duration. Live each moment passionately and authentically, embracing those special relationships to their fullest. No regrets, TVM. And that is the strength of this wonderful man who wouldn’t even let cancer harm his spirit. He is a hero and each of us needs to heed the lesson HE LIVED!